However, should children this young be vaccinated for measles, when elsewhere in the world the measles vaccine is not offered to children under the age of one year? 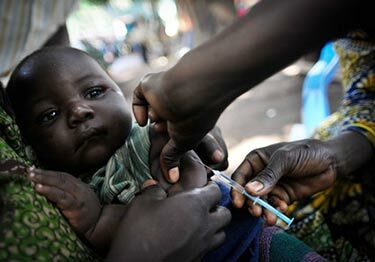 As a result of the above recommendations, the Kenyan Ministry of Health today continues to vaccinate children from the age of nine months for measles. However, the information supplied by the WHO in 2002 appears to be in direct conflict with the information provided by the Centers for Disease Control and Prevention (CDC) in a paper titled Measles Prevention: Recommendations of the Immunization Practices Advisory Committee (ACIP), written in 1989. The CDC made it abundantly clear that children below the age of twelve months needed to be revaccinated because the measles vaccine was less effective in younger children. Their findings were further reiterated in a study carried out by researchers in Dehli in 2011. Have the WHO’s Actions Caused the Death of Two Infants? At the beginning of September 2015, a website titled AllAfrica reported that two children had died and ten others had suffered severe adverse reactions after receiving the measles vaccine in Marakwet, Kenya. As a result, all further vaccination with the measles vaccine ceased and samples of the vaccine were sent to the government chemist for testing. “We saw children who got paralyzed in Busia county after vaccination, now we are witnessing deaths in Elgeyo Marakwet. We don’t want further casualties in other areas. Sadly, these are not the only casualties being reported as All Africa later added that at least 18 children were paralyzed following vaccination in Akichelesit dispensary, Teso, in July. “The church has more often than not raised concerns over vaccination administration in the country but the national government has ignored our input. He also stated that questionable vaccines must be tested and the results given to the public to reassure them of vaccination safety. Despite their requests for answers and reassurance, however, the Catholic Church reported that, once again, they have been ignored. “We were completely locked out of the measles case. When the pathologist we commissioned went to the hospital for the postmortem, he found that it had been performed the day before and the bodies prepared for burial even though the burial date had not been set! Furthermore, even the family appointed witness to the postmortems was not allowed to participate nor take any samples from the bodies. As it stands now, only the government was represented at the postmortem and only the government collected samples. From our past experience, there is not value in whatever results they will declare if at all they do. As usual, it appears that yet another vaccine tragedy has been covered up by government officials. Why was the government so keen for the postmortem results to be hidden from the Catholic Church, and why were the families own appointed witnesses prevented from attending the postmortem examinations? It is easy to blame inexperienced staff for the deaths of these children; however, according to reports, these same staff had been vaccinating children for many years. It is extremely sad that two nine month-old children have lost their lives after being given a vaccine already proven by the CDC and researchers from the University College of Medical Sciences to be inefficient in this age group, especially when you consider that these same researchers were questioning the timing of this vaccine as far back as 2011.